Why are we consulting about the REF 2021 Guidance now? 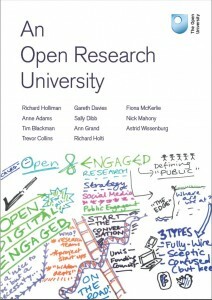 An open research university (Holliman et al. 2015). Design: Peter Devine. Image: Beck Pitt. Impact was assessed retrospectively in REF 2014, which generated some controversy at the time because universities and researchers were required to report the outcomes of work that had not always been planned for. When planning for REF 2021, universities and researchers could reasonably have expected impact to be part of this assessment, not least because the submission of Pathways to Impact Planning within grant applications remained a requirement (UKRI Pathways to Impact), and further initiatives to support changes in organisational structures and cultures of research were funded (e.g. Catalyst Seed Fund; SEE-PER). However, until two-weeks ago, there was no detailed guidance about the requirements for impact within REF 2021. In effect, universities and researchers have had to rely on their own initiative(s), guidance from organisations like the NCCPE, the REF 2014 documentation (e.g. Panel Guidance and Working Methods), the results from REF 2014, and various meta-analyses (e.g. NCCPE, 2017) to prepare for REF 2021. All of this has been helpful, but it hasn’t offered definitive guidance. Is there an alternative way of working for the REF after REF 2021? Is there a better way to enable and sustain excellence in research impact? Let’s assume that we’ll have another REF in the not-too-distant future. It’s a reasonable assumption to make given that universities are also facing the demands of the TEF and the impending KEF. The audit culture is now a routine part of university life. If we follow the same rough schedule in terms of timing for the REF, is there a better way to enable and sustain excellence in research impact for REF 2028? Could we agree that, following the revisions that result from the current consultation, the finalised versions of the REF 2021 guidance will formally become the draft documentation to support the next REF? By this point we will have completed two cycles of REF Guidance Consultation. We should be pretty confident about the guidance. As an example, I note the welcome changes included in Annex A of the Panel Criteria and Working Methods. An inclusive, panel-wide approach to the areas, types and indicators of impact is a step forward from REF 2014. This approach looks sound. We could perhaps improve on the level of detail, but not the overarching principle. Publishing the guidance for REF 2028 in draft form prior to REF 2021 would be enormously helpful for universities, not least because REF 2021 includes a requirement in the Environment section to plan for how research and impact will be enabled for the five years that follow REF 2021. Offering clear guidance about the parameters of REF 2028 would support this planning exercise so that the documentation can be operationalised authentically. Once the results of REF 2021 have been published and the relevant reviews have been completed, this would provide a timely opportunity for Research England to run a consultation to finalise the documentation for REF 2028. This could take place in 2023, given universities plenty of time to plan ahead. For the avoidance of doubt, I’m putting this idea out there for discussion. If you think it could work, specifically if you think it could be helpful for enabling excellence in impact in the long-term, feel free to refer this argument in your response to the consultation.